Motor yacht GOLDEN TIMES (previously "Golden Boy") is a 28,65m (94’) Hargrave designed and built charter yacht. Motor yacht GOLDEN TIMES is based in the Caribbean and the Bahamas and offers luxurious accommodation for up to 7 guests in 3 cabins. 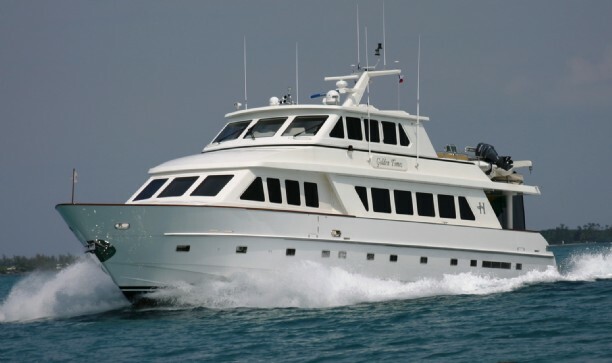 GOLDEN TIMES is a great yacht for family or couples charters with ample space and amenities for a yacht of her size. 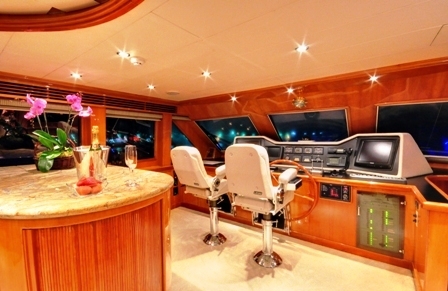 Hargrave Motor yacht GOLDEN TIMES (ex"Golden Boy") has a comfortable main salon arrangement of sofas to the port and starboard. There is plenty of space where guests can relax, enjoy playing board games, or gather for movies or video games in front of the large flat screen TV. The formal dining area is just forward of the salon separated by a granite topped cabinetry of light cherry wood and maple inlay. GOLDEN TIMES sky lounge is the perfect area to lounge, enjoy cocktails take in the panoramic view or watch the Captain expertly manage the helm station. The boat deck is located Aft of the sky lounge where you can enjoy the sun or sit at the table on chairs or bench seating under the umbrella with the fresh ocean breeze. The Spa Pool on this deck is a favourite spot both day and night. 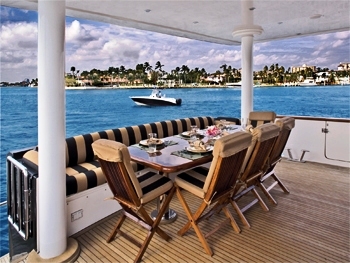 Motor yacht GOLDEN TIMES Aft Deck has an al fresco dining table and access to the boat deck and swim platform from where you can enjoy the impressive array of water toys carried onboard. Tenders and Toys include a including a 27’ Boston Whaler with two 225hp Mercury Engines, a 16' Novurania with 90hp Yamaha, Snorkeling equipment2 kayaks, Towable Toys including a Kneeboard, Wakeboard, Waterski’s 2 Boogie Boards, a Banana, a Floating or towable mat, fishing gear, beach toys and Board Games. 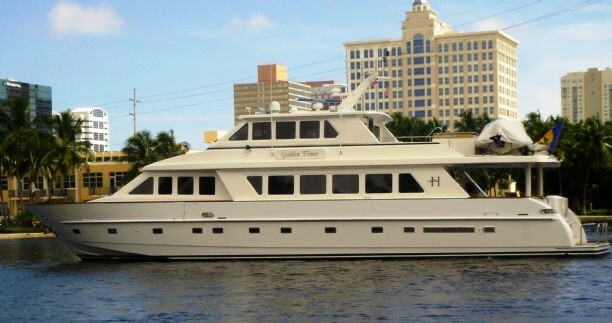 Motor yacht GOLDEN TIMES was built in 2001 and in 2007/2008 she had her hull and topside repainted. 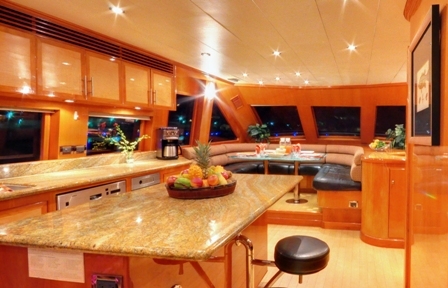 Some interior soft goods were upgraded and in 2009 she received new flat screen TV’s, additional satellite receivers for guest cabins, Ipod auxiliary and exterior boat deck speakers. M/Y GOLDEN TIMES has a professional crew of 4 ready to welcome you onboard. 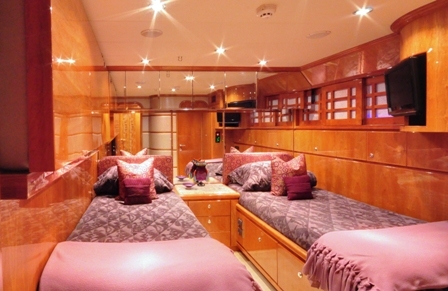 Motor yacht GOLDEN TIMES ex Golden Boy is able to accommodate up to 7 guests in 3 cabins. 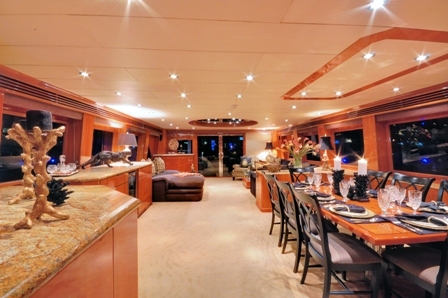 Her Master Stateroom is located below deck aft, and is full width of the beam. 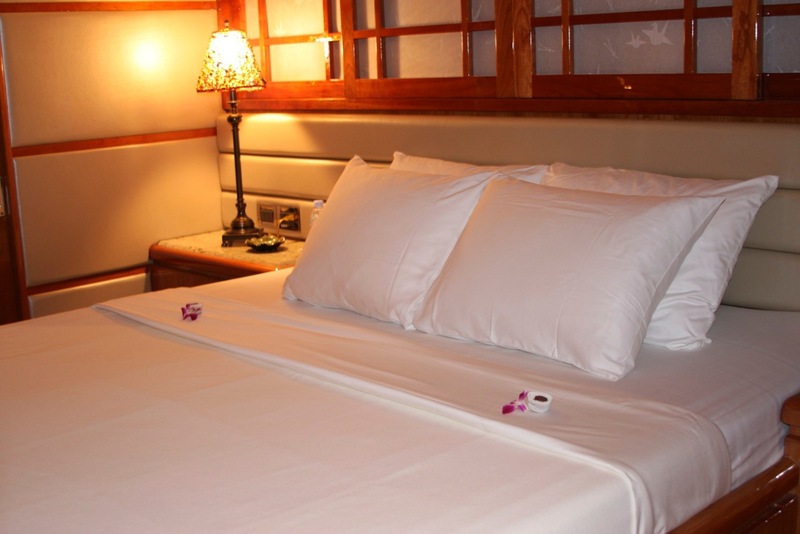 This cabin features a King sized bed, two walk-in wardrobes a vanity and settee plus a large flat screen TV with individual satellite receiver and CD/DVD player. The Master cabin has an ensuite head with adjoining central tub/shower combo for his and her use. 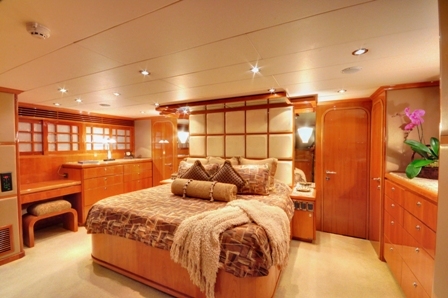 The VIP cabin is located below deck amidship to port and features a Queen bed, hanging wardrobe, ensuite head with stall shower and flat screen TV with DVD player. 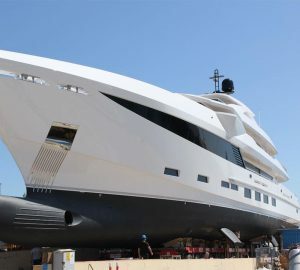 The Twin Stateroom is below deck amidship to starboard with two Twin beds and one Pullman, ensuite head with stall shower, vanity/desk and flat screen TV with DVD player. 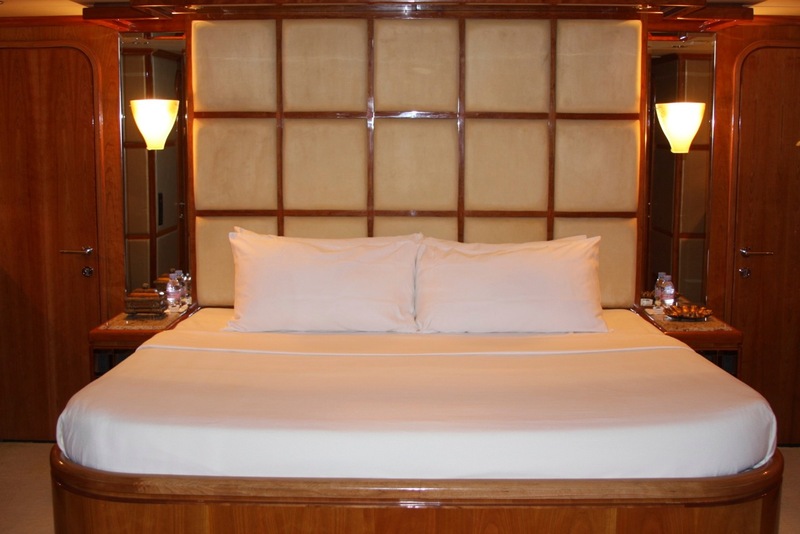 Each stateroom has an Ipod alarm clocks with docking stations in Main salon and Sky lounge. Motor yacht GOLDEN TIMES has an impressive range of tenders and toys including a 27’ Boston Whaler w/ 2 x 225hp Mercury Engines, a 16' Novurania with 90hp Yamaha, Snorkeling equipment child and adult sizes, Beach toys: Frisbee, football etc, 2 kayaks, Towable Toys including a Kneeboard, Wakeboard, Waterski’s (adult and child), (2) Boogie Boards, Banana, Floating or towable mat, 2 Penn Casting Rods, 4 Shanano TLD 25 Casting / lite Troweling Rods, Tackle for casting and Troweling, and Board Games (7 Classics). Communications include SatCom, Cell Phone/Fax, Printer, Fax, WiFi near port only, SSB Radio, 2 VHF Radios. 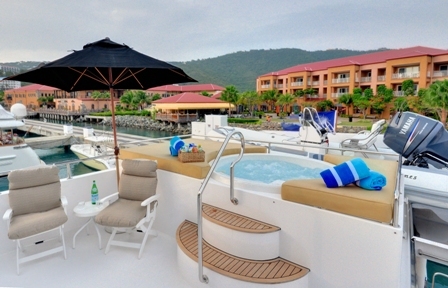 Audio Visual Equipment and Deck Facilities include Full al fresco dining, access from aft to swim platform or boat deck, refrigerator and service area on the Aft Deck. A table, chairs, bench seating, umbrella and Spa Pool with sunpad on the Boatdeck. Audio Visual equipment includes Flat screen TVs, CD, DVD capability throughout with surround sound + exterior boat deck speakers, Ipod alarm clocks with Salon and Skylounge docking, Individual Satellite TV Receivers, A/V Library for movies and music – 200+, Sony PS3.